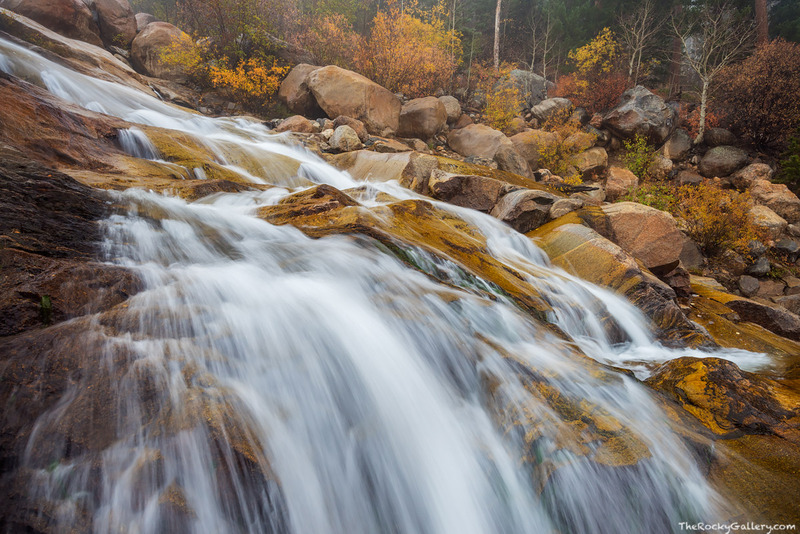 Alluvial Fan Falls cascades down the rocky landscape formed by the Roaring River. It's a cold late October day in Rocky Mountain National Park and light snow is falling on Horseshoe Park. There is still plenty of fall color in the bushes and trees along the Roaring River but after this October storm many of the leaves will have fallen and ice will begin to cast it's grip on Alluvial Fan Falls as Rocky Mountain National Park transitions from the fall to winter season. Photo © copyright by Thomas Mangan.